This page lists articles that were previously featured on the Main Page of Lockwiki. If you have any suggestions for future features please add them to Template_talk:Main_Page/Featured_articles. 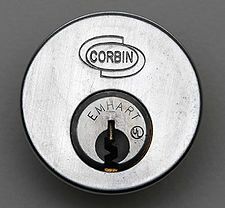 The Emhart is a UL 437 rated pin-tumbler lock made by Corbin Russwin. The Emhart is best known for having interlocking pins that provide resistance to lockpicking and make the lock immune to key bumping attacks. The Emhart is one of the few pin-tumbler locks that uses axial rotation as one of its key control and pick-resistance features. 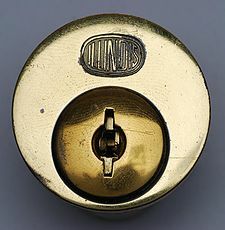 The Duo is a UL 437-rated wafer lock made by Illinois Lock Company. The Duo uses a total of 18 wafers that interface with three active bitting surfaces on the bottom, top, and side of the key. The Duo is popular in the United States in laundromats, vending machines, and money containers. 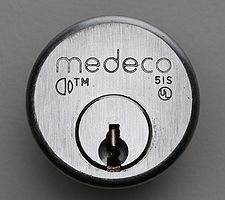 The Biaxial is a UL 437 rated pin-tumbler lock made by Medeco. It is well known for the use of rotating bottom (key) pins that interface with a sidebar. 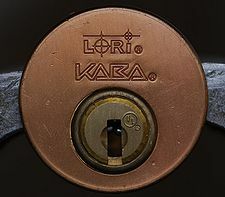 The Biaxial is one of the most widely used American high security locks. 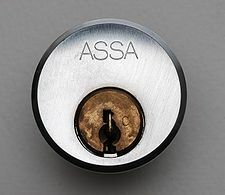 The Twin Combi is a pin-tumbler lock made by ASSA. The Combi uses pin-tumblers and a sidebar to provide two layers of security. The Combi has the first sidebar in the Twin series that requires finger pins be raised and rotated properly. The Gemini is a UL 437 rated dimple lock designed by KABA. The Gemini uses three rows of dimple pins oriented at 4, 8, and 12 o'clock. The Gemini is one of the few pure pin-tumbler locks that is protected against key bumping by design. This page was last modified on 5 February 2015, at 14:06. This page has been accessed 46,535 times.